(CNN) -- Roger Federer has reluctantly pulled out of next week's tournament in Dubai and Switzerland's Davis Cup date in the U.S. as he bids to fully overcome a nagging back problem. 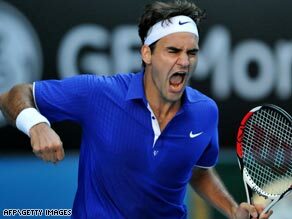 Federer wants to fully overcome back trouble as he bids for a record-equalling 14th career Grand Slam triumph. World number two Federer was denied a career record-equalling 14th Grand Slam triumph last month when he was beaten in five sets by big rival Rafael Nadal. "I am disappointed to announce that I am withdrawing from both Dubai and the Davis Cup tie in the United States," Federer announced on his Web site on Tuesday. "This was a hard decision to make as I am missing not only one of my favorite events on tour in Dubai but I am also missing out on an opportunity to help my country try and move on to the next round of Davis Cup." The tie is set for Birmingham, Alabama, starting on March 6 and is followed by the Indian Wells hardcourt tournament. Federer admitted: "After injuring my back last fall, I did not have enough time to strengthen it completely. "As a precautionary measure, I will use the next few weeks to make sure the back injury is fully rehabilitated and I am ready for the rest of the 2009 season." Federer next big target is the French Open at Roland Garros in Paris from May 24 with the other Slam dates at Wimbledon in late June and the U.S. Open at Flushing Meadows, New York at the end of August.